Bolivia is the best country in the world to see macaws. Bolivia has twelve species of macaw, the highest diversity of macaws in the world (Costa Rica has three species of macaws). In Bird Bolivia, we have used our local knowledge and new lodges to create the first parrot tour for Bolivia, a once in a lifetime experience. Our Macaw tour in June 2014 saw 28 parrot species, including 9 Macaw species, 13 Parakeets and 6 Parrots (4 Amazons and 2 Pionus) (see parrot list below). We will visit five very distinct habitat types in Bolivia and Brazil including the Rainforest, Tropical Savanna, and the Pantanal. We will put you in the best spot to have long, repeated views of nine macaws (nothing in nature is 100% guaranteed, but we are pretty close). 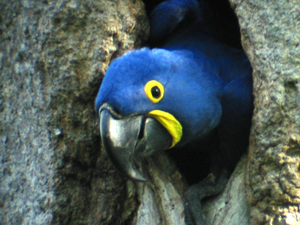 You will enjoy the Supersized Hyacinth Macaw; the large Red-and-green and Blue-and-yellow Macaw; to the medium Blue-throated and Red-fronted Macaw- both threatened with extinction and only found in Bolivia. Bird Bolivia has the best spots to take frequent and long looks at these magnificent creatures. The tour will begin and end in the city of Santa Cruz, Bolivia. We will start by stepping into the humid hot rainforest, but through a cooler beautiful foothill recently created lodge called Sadiri. Here we will search for the forest parrots, including the robust Red-and-green Macaw, the White-bellied Parrot, and the Rose-fronted Parakeet. We will visit a rainforest wetland to watch the antics of the Red-bellied Macaw, a species highly associated with the wetland Royal Palm. We will then travel to the tropical savannas of Beni to stay at the fantastic Barba Azul Nature Reserve, names in Spanish for the best site in the world to see the Critically Endangered Blue-throated Macaw. Here we will observe the normally ridiculously rare Blue-throated Macaw, but the reserve protects the last large groups, plus Blue-and-yellow Macaw, Yellow or Golden-collared Macaw, and possibly Red-shouldered Macaws. From the tropical grasslands of Beni we fly to the Bolivian border town of Puerto Suerez, to walk into Brazil and make a three hour drive to a great air-conditioned lodge within the rich Pantanal wetland habitat of Brazil. The Pantanal of Brazil protects the absolutely spectacular Hycinth Macaw. This site will offer repeated views of this tame stunning macaw through-out the habitat. Then the trip climbs out of the hot humid tropics towards up Bolivia’s Andes Mountains to observe parrots adapted to this cooler environment. We will spend a day in the cloud forest searching for the rare Tucuman Parrot in a protected area. spectacle of nature as the Red-fronted Macaws visit and breed in a massive rocky cliff. Six parrot species live along the river edge vegetation of this dry habitat. The trip will also be full of amazing Bolivian wildlife including Peccaries, Giant Anteater, Howler Monkeys, and the amazing Bolivian birds like Jabiru, Maguari Stork, Toco Toucan, and Andean Condor. Macaw tour for Parrot lover vs birders. 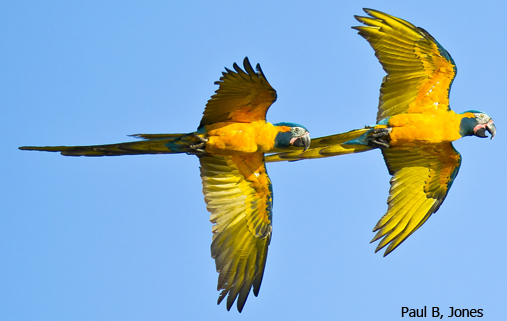 The Parrot lover tour will dedicate more time observing macaws and parrots in the wild. This tour will not be about working on a day list of all the birds, and we will not be working to show the small brown flycathers and ovenbirds. More time will be devoted to parrot observation. Whereas the Birders Macaw Tour will make sure to see all parrots, but we will also be showing and spending time trying to find all birds possible in the area, including the small brown flycatchers and ovenbirds. This tour will end each day recording a list of all the birds seen during the day.